The Lego Lord of the Rings Achievements guide & Trophies guide lists every Achievement & Trophy for this Xbox 360, PC, PS3 & PS Vita Action-Adventure game and tells you how to get and unlock them. There are 48 Achievements (4 Secret) with a total of 1,000 Gamerscore points to earn in the Xbox 360 version. 1. The strength of Men failed. (25G) — Complete ‘Prologue’. 2. It’s a dangerous business… (25G) — Complete ‘The Black Rider’. 3. That is no trinket you carry. (25G) — Complete ‘Weathertop’. 4. The long way around. (25G) — Complete ‘The Pass of Caradhras’. 5. This is no mine… it’s a tomb. (25G) — Complete ‘The Mines of Moria’. 6. Let’s hunt some Orc! (25G) — Complete ‘Amon Hen’. 7. On the Precious… (25G) — Complete ‘Taming Gollum’. 8. Soft and quick as shadows… (25G) — Complete ‘The Dead Marshes’. 9. Safe is where I’ll keep you. (25G) — Complete ‘Track Hobbits’. 10. Stinking creatures… (25G) — Complete ‘Warg Attack’. 11. The battle is about to begin… (25G) — Complete ‘Helm’s Deep’. 12. A Wizard should know better! (25G) — Complete ‘Osgiliath’. 13. Naughty little fly… (25G) — Complete ‘The Secret Stairs’. 14. We did it, Mr. Frodo. (25G) — Complete ‘Cirith Ungol’. 15. They have been summoned. (25G) — Complete ‘The Paths of the Dead’. 16. You and whose army? (25G) — Complete ‘The Battle of Pelennor Fields’. 17. This day we fight! (25G) — Complete ‘The Black Gate’. 18. It’s gone. (25G) — Complete ‘Mount Doom’. Tip: See how to find all 250 Mithril Bricks in our Lego Lord of the Rings Mithril Bricks Locations Guide. Tip: See how to find all 20 Red Bricks in our Lego Lord of the Rings Red Bricks Locations Guide. Tip: Find out how to locate all Map Stones in our Lego Lord of the Rings Map Stones Locations Guide. Tip: To find all 84 playable characters, check out our “How To Unlock All Lego Lord of the Rings Characters” guide page. 27. The Lord of the Ring. (30G) — Complete the Bonus Level. 29. I’m glad to be with you. (10G) — Complete a level in co-op. 30. Don’t tell the Elf… (10G) — Throw Gimli 30 times. Requirements: After you’ve finished “Level 4: The Pass of Caradhras”, you unlock Gimli. Location: Once you have him in your character wheel, you can simply use any of the big characters to toss him into objects or simply play “keep the dwarf off the ground” 30 times. 31. Our only wish to catch a fish! (10G) — Fish perfectly 20 times by pressing the icon as it flashes. 33. … And away he goes, Precious! (10G) — Defeat Gollum as Gollum. Tip: After buying Smeagol, play as Gollum yourself and your play partner as Smeagol. Then go somewhere in-game and have Gollum punch Smeagol until he dies. Tip 2: You can also kill him in the mission you fight him, but it’s much easier to kill him with a second character as shown in the video guide below. 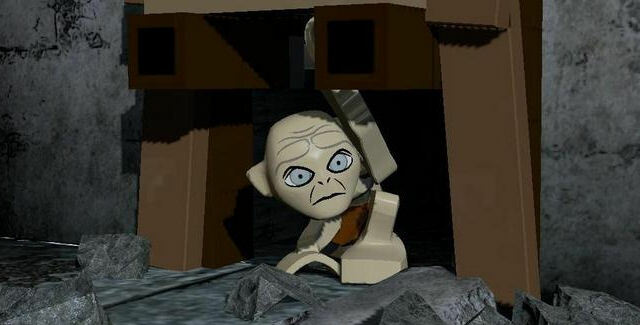 Once you unlock Gollum after finishing “Level 12: Osgiliath”, simply select him with both on screen characters and attack one with the other until he falls to Lego pieces. 34. What about second breakfast? (10G) — Complete 2 cooking puzzles. 35. That one counts as mine! (10G) — Finish one of Gimli’s opponents as Legolas in ‘Helm’s Deep’. 36. I’ve always been taller! (10G) — Use the Ent Draught on Pippin. 37. We cannot linger. (10G) — Complete ‘The Mines of Moria’ in under 15 minutes. 38. Dance of the dead. (10G) — Turn an enemy into a skeleton and make them dance. 39. Pointy-eared Elvish princeling. (10G) — Defeat 42 Uruk-hai as Legolas. You can kill them during the missions that have Uruk-Hai in them, or you can do it after obtaining Uruk-Hai from Helms Deep and shoot him (aka player two) 42 times. 40. Great! …Where are we going? (5G) — Form The Fellowship of the Ring. 41. Taking the Hobbits to Isengard. (10G) — Travel to Isengard as every playable Hobbit. Requirements: It’s recommended you finish the Story Mode campaign before attempting this, so you have access to all characters shown in the video guide below. The needed Hobbits are: Frodo, Sam, Merry, Pippin, Rosie, and Bilbo. (To find them all, check out our unlockable characters guide linked to at the top of this page). Location: Once you have all Hobbits in your arsenal, you can start traveling from anywhere outside of Isengard. Make sure you have a new Hobbit you have not traveled with each time you are about to travel TO Isengard or it might reset your characters to Frodo and Sam like you will see happening in the example video! Repeat the trip with Frodo, Sam, Merry, Pippin, Rosey, and Bilbo. 42. An expected journey. (5G) — Travel to Trollshaws as Bilbo. Requirements: After you’ve finished “Level 2: The Black Rider”, Bilbo gets unlocked and in the open World you can buy him for 125,000 studs. Location: Once you have him in your arsenal, you can simply travel to Trollshaws which is a forest just South West from Rivendell. We travel too Weathertop because its actually closer to walk to from then Rivendell, and then we simply head East to enter the small forest of Trollshaws. 43. Return of the Mushroom King. (5G) — Equip Aragorn with the Mushroom Crown. 44. Worth greater than the Shire. (10G) — Dress a character completely in treasure items. 45. One does not simply… (5G) — Walk into Mordor. 46. That still only counts as one! (10G) — Defeat an Oliphaunt as Legolas. 47. It won’t be that easy! (5G) — During ‘Prologue’, jump into the fires of Mount Doom as Isildur. There are 49 Trophies (4 Hidden) that can be earned in the PS3 version. Earn Bronze (40), Silver (5), Gold (3), and Platinum (1) Trophies to increase your Gamer Level. 1. One Ring to build them all. (Platinum) — Collect every trophy. 2. The strength of Men failed. (Bronze) — Complete ‘Prologue’. 3. It’s a dangerous business… (Bronze) — Complete ‘The Black Rider’. 4. That is no trinket you carry. (Bronze) — Complete ‘Weathertop’. 5. The long way around. (Bronze) — Complete ‘The Pass of Caradhras’. 6. This is no mine… it’s a tomb. (Bronze) — Complete ‘The Mines of Moria’. 7. Let’s hunt some Orc! (Bronze) — Complete ‘Amon Hen’. 8. On the Precious… (Bronze) — Complete ‘Taming Gollum’. 9. Soft and quick as shadows… (Bronze) — Complete ‘The Dead Marshes’. 10. Safe is where I’ll keep you. (Bronze) — Complete ‘Track Hobbits’. 11. Stinking creatures… (Bronze) — Complete ‘Warg Attack’. 12. The battle is about to begin… (Bronze) — Complete ‘Helm’s Deep’. 13. A Wizard should know better! (Bronze) — Complete ‘Osgiliath’. 14. Naughty little fly… (Bronze) — Complete ‘The Secret Stairs’. 15. We did it, Mr. Frodo. (Bronze) — Complete ‘Cirith Ungol’. 16. They have been summoned. (Bronze) — Complete ‘The Paths of the Dead’. 17. You and whose army? (Bronze) — Complete ‘The Battle of Pelennor Fields’. 18. This day we fight! (Bronze) — Complete ‘The Black Gate’. 19. It’s gone. (Bronze) — Complete ‘Mount Doom’. 28. The Lord of the Ring. (Silver) — Complete the Bonus Level. 30. I’m glad to be with you. (Bronze) — Complete a level in co-op. 31. Don’t tell the Elf… (Bronze) — Throw Gimli 30 times. 32. Our only wish to catch a fish! (Bronze) — Fish perfectly 20 times by pressing the icon as it flashes. 34. … And away he goes, Precious! (Bronze) — Defeat Gollum as Gollum. 35. What about second breakfast? (Bronze) — Complete 2 cooking puzzles. 36. That one counts as mine! (Bronze) — Finish one of Gimli’s opponents as Legolas in ‘Helm’s Deep’. Location: Can be done in “Level 10: Helm’s Deep”. After the cut scene in which Gimli steps up to knock the baddies off of the ladders attacking the castle, make sure that you use Legolas to complete this part of the mission. We do start with Gimli and change to Legolas shortly after to take out the Orcs. 37. I’ve always been taller! (Bronze) — Use the Ent Draught on Pippin. 38. We cannot linger. (Bronze) — Complete ‘The Mines of Moria’ in under 15 minutes. 39. Dance of the dead. (Bronze) — Turn an enemy into a skeleton and make them dance. 40. Pointy-eared Elvish princeling. (Bronze) — Defeat 42 Uruk-hai as Legolas. 41. Great! …Where are we going? (Bronze) — Form The Fellowship of the Ring. 42. Taking the Hobbits to Isengard. (Bronze) — Travel to Isengard as every playable Hobbit. 43. An expected journey. (Bronze) — Travel to Trollshaws as Bilbo. 44. Return of the Mushroom King. (Bronze) — Equip Aragorn with the Mushroom Crown. 45. Worth greater than the Shire. (Bronze) — Dress a character completely in treasure items. 46. One does not simply… (Bronze) — Walk into Mordor. 47. That still only counts as one! (Bronze) — Defeat an Oliphaunt as Legolas. 48. It won’t be that easy! (Bronze) — During ‘Prologue’, jump into the fires of Mount Doom as Isildur. There are 27 Trophies (2 Hidden) that can be earned in the PS Vita version. Earn Bronze (13), Silver (6), Gold (7), and Platinum (1) Trophies to increase your Gamer Level. 1. One Ring to build them all. (Platinum) — Obtain all other Trophies. 2. The day the strength of men failed. (Bronze) — Complete The Battle of the Last Alliance. 3. It’s a dangerous business going out your door. (Bronze) — Complete The Black Rider on the Road. 4. That is no trinket you carry… (Bronze) — Complete The Camp at Weathertop. 5. This is no mine… It’s a tomb! (Bronze) — Complete Moria: Balin’s Tomb. 6. Let’s hunt some Orc! (Bronze) — Complete The Skirmish of Amon Hen. 7. On the precious… (Bronze) — Complete The Taming of Gollum. 8. Safe is where I’ll keep you. (Bronze) — Complete Track the Hobbits. 9. You shall not pass! (Bronze) — Complete Moria: Bridge of Khazad-dûm. 10. The battle for Middle-earth is about to begin… (Bronze) — Complete The Battle of Helm’s Deep. 11. Naughty little fly! (Bronze) — Complete Shelob’s Lair. 12. They have been summoned… (Bronze) — Complete The Paths of the Dead. 13. You and whose army? (Bronze) — Complete The Battle of the Pelennor Fields. 14. This day we fight! (Bronze) — Defeat the Mouth of Sauron. 15. It’s gone… (Gold) — Complete Journey’s End. 16. My precious! (Gold) — Collect every collectible. 17. There’s some good in this world, Mr. Frodo. (Gold) — Deliver all the treasure items. 19. Of all the inquisitive Hobbits… (Silver) — Collect all the Character Profiles. 22. Hobbits really are amazing creatures. (Gold) — Complete all the HUB mini games. 23. And away he goes, Precious! (Silver) — Use Smeagol to defeat Gollum when Gollum is the buddy. 24. What about second breakfast? (Silver) — Complete Weathertop in Free Play. 25. That still only counts as one! (Silver) — Defeat an Oliphaunt as Legolas. 27. The last laugh. (Gold) — Use Tom Bombadil’s laugh to destroy Sauron in Free play. Thanks to Happythumbsgaming for the achievement tips & guide videos. Please comment if you have any Lego Lord of the Rings achievement/trophy unlock tips of your own. Kudos will be given. – Thanks for visiting!